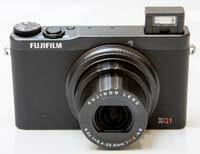 The Fujifilm XQ1 is an advanced compact camera that offers a 12 megapixel 2/3-type X-Trans CMOS II sensor with built-in Phase Detection pixels and no low-pass filter, a 4x, 25-100mm, f/1.8-4.9 zoom lens with optical image stabilisation and a control ring, a Lens Modulation Optimiser which automatically corrects diffraction blur, 1080p movie recording at 60fps, fast hybrid auto-focus system (0.06 seconds), wi-fi connectivity, 12fps burst shooting and a 3-inch LCD monitor with a resolution of 920,000 dots. Other key features of the Fujifilm XQ1 include an ISO range of 100-12,800, full range of manual controls, Focus Peaking for easier manual focusing, raw image capture and development, an integrated manual pop-up flash, a range film simulation modes and creative effects, 360° motion panoramas, 3cm macro mode and an electronic level gauge. 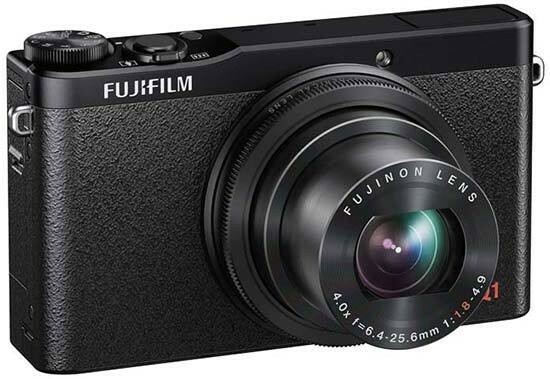 The Fujifilm XQ1 is available in black or silver priced at $499.95 / £349.99. The Fujifilm XQ1 is the smallest and cheapest X-series compact camera yet, clearly designed to take on the likes of the Sony Cyber-shot DSC-RX100, Canon PowerShot S120, and Nikon Coolpix P330. Available in a smooth silver finish or a textured black, the Fujifilm XQ1 is another classically styled camera with a subtle, appealingly retro design and an all-metal control ring and dials. The Fujifilm XQ1 has a 4x, 25-100mm zoom lens with a fast aperture of f/1.8 at the wide-angle setting and f/4.9 at full telephoto. In combination with the extensive ISO range of 100-12,800 at full 12 megapixel resolution, this makes the XQ1 well suited to low-light shooting, allowing you to hand-hold the camera in places where you'd usually be reaching for a tripod (if allowed) or other support, especially as the camera also features built-in optical image stabilisation equivalent to 3 EV stops. 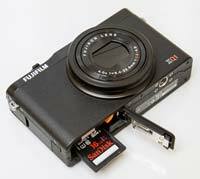 The Fujifilm XQ1 is a very well-built camera, with virtually no flex or movement in its chassis. It weighs in at 206g with the battery and memory card fitted and measures 100.0mm (W) x 58.5mm (H) x 33.3mm (D), making it eminently well suited to life in a trouser pocket. There are some plastic buttons and controls on the XQ1, most notably the memory card / battery compartment door and the rear circular control wheel and buttons, but other that that the XQ1 offers incredible build quality considering its price-tag. There's no hand-grip on the front of the XQ1 just a rubber thumb-rest on the rear, so we'd advise choosing the black version which at least has a textured surface that runs around the full width of the camera to aid grip. Two small metal eyelets on either side of the body are used for connecting the supplied wrist strap. A metal tripod mount is positioned off-centre from the lens away from the memory card / battery compartment, so you don't have to remove the camera from the tripod to change either of them. At the heart of the XQ1 is the same 12 megapixel 2/3-type X-Trans CMOS II sensor that's used by the more expensive and bigger X20 camera, a sensor size that was used by several bridge-style compacts in the past but which has recently fallen out of favour. This sensor is larger than those in most compact cameras and promises to deliver better image quality, although not the equal of a compact system camera or a DSLR, and not as big as the Sony RX100. We ran into some issues in bright sunlight when shooting in aperture and shutter priority modes, where the top shutter-speed limit of 1/1000th second at f/1.8 often caused under-exposure. The XQ1 doesn't feature a built-in Neutral Density filter, so you'll have to stop-down the aperture and sacrifice some depth-of-field to avoid blowing out the highlights. The XQ1 does offer a close focusing distance of 3cm, so macro shooting is definitely on the cards. The Fujifilm XQ1's auto-focusing speed is even quicker than on the already impressive X20. The XQ1 has an ultra-fast hybrid AF system with both a conventional contrast-detection system and built-in Phase Detection pixels which enables the camera to achieve a focus lock in as little as 0.06 second. If you mostly use auto-focus rather than manual then this a great reason to buy the XQ1. Manual focusing is activated by changing the Focus Mode to Manual in the menu system, then using the control ring that encircles the lens to set the distance, with the LCD display automatically zooming in on the subject to help you judge the sharpness. Fujifilm have also included Focus Peaking to make manual focusing even easier, which displays a white line around the subject when it's in focus, something that Sony NEX users in particular have been enjoying for a while. This addition makes manual focusing on the XQ1 more of a pleasure than a chore, with a choice of High and Low settings (you can't change the colour). The Fujifilm XQ1 features a high-resolution 3 inch LCD monitor on the back, which has 920k dots and offers 100% scene coverage. Unlike the Sony CyberShot DSC-RX100 MK II, there's no way to add an optical or electronic viewfinder to the XQ1 - the LCD screen is the only method of composition. The LCD screen offers a handy Info view which presents all of the key settings at once, or you can switch to the Standard or Custom Live View modes, with the latter offering a multitude of customisable options. To make the camera less obtrusive, there's a Silent menu option which turns off the speaker, flash, AF-assist lamp and most importantly the artificially-created shutter-release sound, instantly making the XQ1 better suited to candid photography. In terms of operational performance, the Fujifilm XQ1 is a real speed-demon. Shutter lag is virtually non-existent on this camera, so once you have set the focus, you'll never miss the moment because the camera can't fire the shutter quickly enough. Continuous shooting speeds are impressive, with a top rate of 12fps for 9 JPEGs. Note, though, that both the focus and the exposure are set according to the first frame in each series, so it's not a particularly good system for tracking fast-moving subjects in varied lighting conditions. The write speeds from pressing the shutter button to recording to the SD / SDHC / SDXC memory card are also very good. Shooting a single RAW + Fine JPEG takes about 1.5 seconds to record to the card, and you can take another shot almost straight away thanks to a delay of just 0.3 second. Taking a 12 frame burst took the camera around 5 seconds to save, during which you can take more pictures, but not at the 12fps rate. One area in which the Fujifilm XQ1 excels is its handling, thanks in no small part to the aluminum control ring that surrounds the lens. Fujifilm won't win any awards for originality here, as we've already seen similar implementations on the Canon and Sony equivalents, but it definitely helps make the XQ1 easy to use. By default it controls the manual focusing, aperture, and shutter speed, but it can be configured to change one of seven key settings. 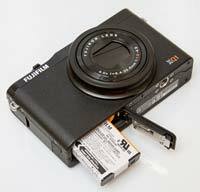 More originally, Fujifilm have implemented a button called Expansion Function (E-Fn) button on the back of the camera. Press this, and the navigation pad and the two buttons above it effectively offer a second set of options - so, in addition to the defaults shown on the back of the camera, with a press of E-Fn you also get Continuous, White Balance, Focus Point and ISO settings on the navigation pad and Film Simulation Focus Mode on the two buttons above - very clever. Again you can reconfigure this function to suit your way of working. On top of the XQ1 is a tactile dial for changing the the shooting mode, a small but responsive shutter release button encircled by a push/pull zoom lever, - a tiny on/off button, holes for the stereo speaker, and finally the camera's built-in pop-up flash, which is opened via a switch located behind it and which has a range of 50cm - 7.4m at the 25mm wide-angle focal length. The Fujifilm XQ1 can record full 1080p movies at 60/30fps with stereo sound, started with a press of the dedicated movie button on the rear. There are also several slow motion options - 30fps or 80fps at 640x480 pixels, 150fps at 320x240, and 250fps at 320x112. You can set the aperture and shutter speed before recording begins, but not during, and you can also set the Film Simulation mode, so black and white footage is possible. Continuous auto-focusing is possible, and you can manually focus too, which encourages some more creative effects. There is a HDMI port for connecting the XQ1 to a high-definition TV, although as usual there's no cable supplied in the box. Also missing is a paper copy of the otherwise helpful manual, which is supplied on CD-ROM instead, along with the consumer My software the slow and rather unintuitive RAW converter (essentially a specially customised version of the commercial Silkypix application). The X-E2 is the latest X-series camera to feature built-in wi-fi connectivity, although it's rather restricted in use as it has to be paired with a smartphone. Install the FUJIFILM Camera App and you can transfer your pictures immediately to a smartphone or tablet PC and then edit and share them as you wish, transfer stills and video onto the camera, and embed GPS information in your shots from your smartphone. Note that you can't control the camera remotely, only transfer images. The FUJIFILM PC AutoSave software provides a simple means to back up your photos to your home PC.